I've always been the pedantic sort that strictly adheres to the time-tested method of organising books alphabetically by author; going so far as to separate fiction and non-fiction, then reserving a spare shelf (or several) for "yet to be read" books. That was when I had the pleasure of sprawling my collection across several large bookcases, having the luxury of a miniature (yet ever-growing) library at my fingertips. Since moving I've had to downsize my collection considerably (weep) resulting in a mere two modest bookcases to shelve the remaining favourites. While my vintage book collection is organised by height, housed above a small collection of graphic novels (also organised by height requirements), in a separate room, hidden from prying eyes (and fingertips); the rest of the collection has been organised by colour.. for no other reason than it looks rather lovely. I might never find any book I want to read ever again since adopting this pretty yet haphazard organisation system (not so much now but definitely when my collection begins to grow again), but at least the shelves make for a colourful addition to our living space. i've always thought it looked so pretty, but yeah, hard to find what you want unless you know the spine well. we don't have much room here either, i only have one full bookcase, a shelf and a small pile. because most of my books are art books and tend to vary wildly in size and width, i prefer to sort by height so that it looks neater. when i think of loads and loads of books all piled, i always think of black books. It does look lovely, I actually arrange my DVDs on their shelves in colour order and by some miracle (I have a terrible memory) I can always remember what colour a DVD is so I find what I'm looking for easily. I arrange my books by author but sometimes the size differences really bother me because it looks a little messy to the eye. One day I'll find the perfect system! there's actually a great article about different book placements in an interior design website i look at. i tried finding it again but failed :( basically examples of some of your suggestoins were shown. i'm way too organized to let things to by anything but the alphabet though lol. i'd go crazy if i didn't know where to find a book quickly. Mine aren't organised at all really, but I only have one small bookcase, so they've no need to be. I love this post. I have been seeing more and more things from clothing to books being color coordinated and I think it's really lovely and adds a nice touch to any room! Thank you for sharing! 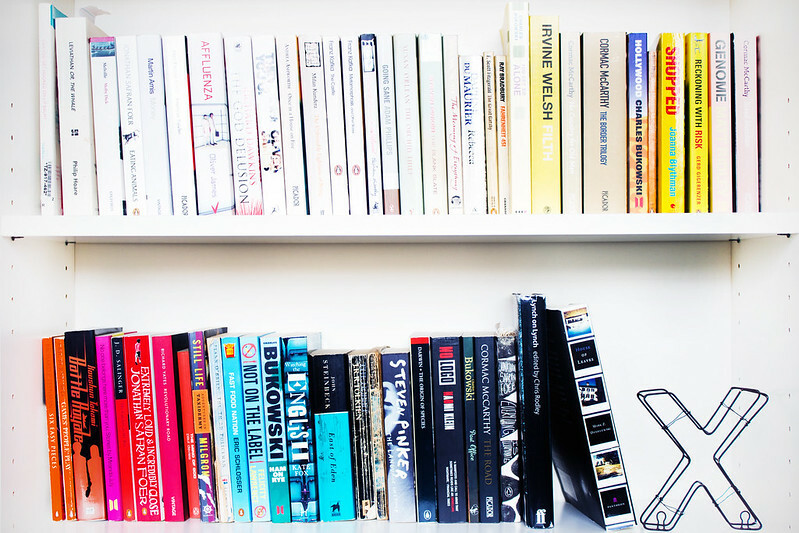 I looooove bookshelves organized by colour, theres just something so therapeutic about it ! I also organize them by largest to smallest, but colorizing them is a good Idea to - I shall try that. I arrange my books, DVDs and CDs by colour and its surprising how quickly it becomes workable. I genuinely have difficulty finding books on shelves arranged any other way now!